Having trouble finding something to wear from your packed closet? Hunting for an outfit to give a polished look? Hire Bonnie Kurtz, Fashion expert and Style adviser. Bonnie can reduce your closet to fit your current lifestyle and silhouette. With the shopping mistakes gone and only the “Oh, Wow’s” remaining, you will save time and look your best each and every day. Let Bonnie help you speed shop! With almost 2 decades in retail marketing, she knows how to sort through clothing racks in record time. She can guide you to your correct color palette and silhouette. Styling an outfit is very important. With just a few adjustments, styling an outfit can take it from OK to fantastic or from fun to fab. Maybe it is a different hemline or neckline. Maybe it is wearing the proper proportions to give a slimmer silhouette. Maybe it is discovering the proper color palette. Maybe it is choice and number of accessories. Maybe it is the right shoe for your leg shape. Helping clients find their true image is an eye opening experience. With new fashion knowledge you can shop faster and look better. Compliments will come your way. As your stylist, I will make you SHINE! Bonnie has years of experience giving fashion talks and wardrobe seminars and has a long list of fashion talks to choose from. She gets great joy in sharing her fashion knowledge with others and has since getting her degree in Vocation Home Economics Education. Bonnie has produced and hosted over two hundred fashion shows for Stein Mart, charity and non-profit organizations. She knows the ins and outs of creating a beautiful and informative show on the runway. 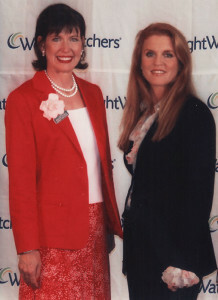 Regional Weight Watchers Rally at Dallas Anatole with the Duchess of York — 1,100 people. Community Enrichment Center Fashion Show, five different years — 250 people each time.